WHY CHOOSE ACE DRIVING SCHOOL? You are the most important person, so everything is geared towards your needs. Each lesson is carefully planned to make the best possible progress depending on your experience. If you come to us with previous driving experience - we do not start from the beginning, but progress to next level. 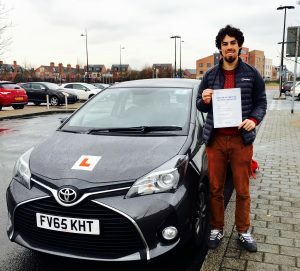 Over 30 years of driving experience and nearly 20 years as an instructor. Teaching is a very skilful profession and we have wide range of knowledge in order to create the best atmosphere for learning. Our philosophy is learning should be fun and that you should enjoy the lessons. You will learn in a relaxed and friendly environment that is conducive to learning with an instructor that is mature and patient and will put you at ease. The motto of DVSA is ‘Safe driving for life’ and we embrace this philosophy wholeheartedly. When you learn with us, we do not teach you just to pass your test but to instil in you the full value of the motto. There are thousands of people who are involved in road traffic accidents every year on our roads. Driving is a necessary but a very serious activity that we undertake everyday of our lives and we do not want our pupils to be a part of those statistics. Our rates are most competitive. You will also save money with our efficient teaching methods enabling you to prepare for your test needing fewer lessons. 65 plate Toyota Yaris 1.4 Icon, d4d. Loughborough, Quorn, Mountsorrel, Barrow upon Soar, Wymeswold, Hoton, East Leake, Wysall, Hathern, Shepshed, Coalville, Sutton Bonnington, Costock, Rothley, Sileby, Woodhouse & Woodhouse Eaves. OUR AIM: To help you learn in a fun and enjoyable environment.